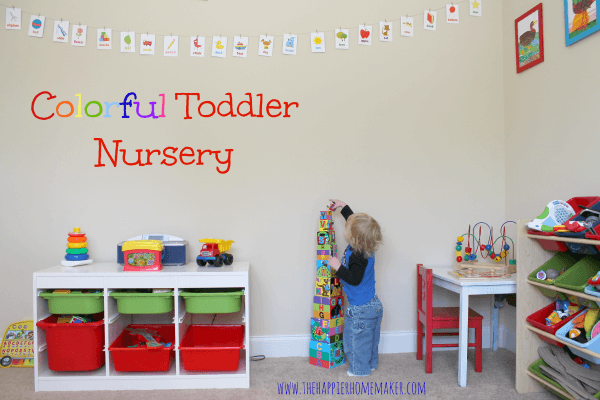 When we first moved into our house last April I shared my youngest son’s nursery with you. 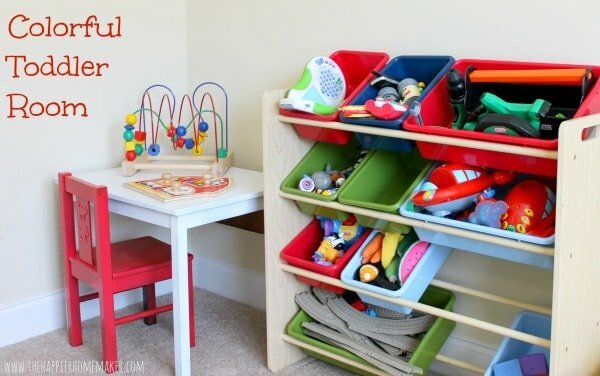 I designed it using Montessori education as inspiration-we have always used a floor bed instead of a crib with Tommy, and I had purchased some IKEA Expedit shelving to keep things low at his level. I was very happy with the nursery at first but over the past few months I knew I needed to make some changes now that Tommy is almost two. 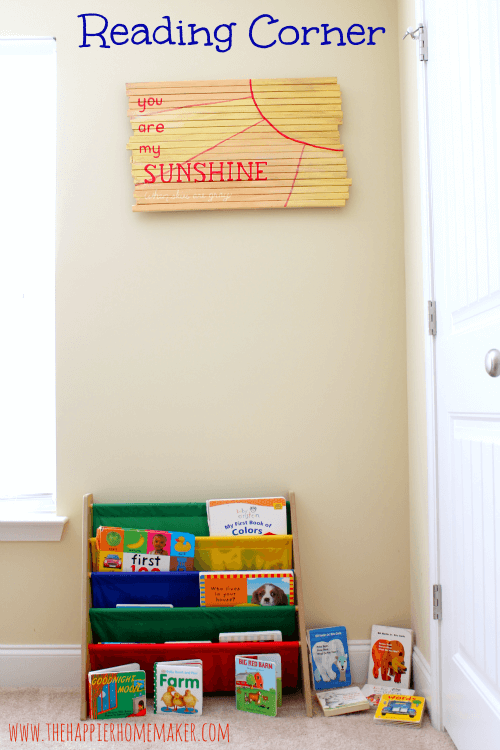 I kept the same DIY wall decor I had previous posted with the exception of adding my upcycled You Are My Sunshine sign over his new reading corner. (I made it from an old baby gate!) He also still has the floor bed with IKEA bedding and leaf canopy (which I love!) The big change was removing the old black Expedit shelving and replacing it with some more colorful storage I snatched from the older boy’s rooms. Oh yes, you’ll be seeing their room transformation soon too-it’s going to be a good one!! The wall art in the picture above was made with $1 frames and pages from a used Eric Carle book! I really love it! You can also see that over the winter I bought him a little slide set to help channel his climbing in the rest of the house! I’m on the fence about putting it outside now that the weather is nice or keeping it inside indefinitely. Oh, and that table in the corner…yeah that was the table I had “transformed” into Nash’s black pirate table last year. Now it’s right back where it started-red and white! I’m so happy with how the room is looking but as with everything it’s a work in progress. I think I’d like to build a cornice over the windows but it’s no where near the top of my to-do list!! What do you think of his nursery? I think it’s so bright and cheerful! Click here to see the original nursery post, as well as the spray paint nursery update, and upcycled sunshine sign. To see how we do our version of Montessori, and do it on a budget, click here. Melissa – I love how bright and colorful it is! Tommy must absolutely love his room! That leaf canopy is too cool! Thanks Keri! I think the room is so cheerful, it makes me smile to go in there! It’s so bright and fun and happy! The perfect place for such a cutie!!! I love it! I need to redo both boys rooms and the bright colors are great! I might be stealing some ideas in the future! Thanks Leah! Let me know if you plan an IKEA run to Charlotte-ill try to meet you there! So fun and cheerful! What toddler wouldn’t love a slide in his room!!! The bright colors are gorgeous. You did an amazing job! How bright and colorful!! Great job!! It’s part of your grand Montessori plan right?? It works and I like it better than the toddler beds I bought for my older boys! 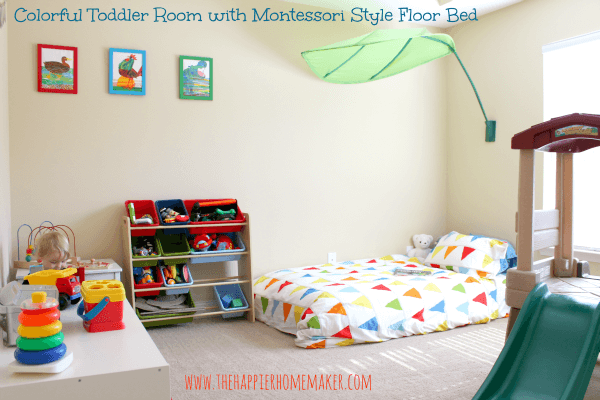 Love this nursery…the floor bed is the best…no worries! Thanks Jessica-for some reason he screamed like a maniac whenever he was in his crib as a baby do I have up and bought him the mattress and he’s been on it ever since! At least we skipped the toddler bed thing too! Such a gorgeous, bright, cheerful set up!! May I ask where you purchased the little bookshelf display stand and the shelf that has the colourful trays tilted on an angle? I believe I found both on Target.com, it was a few years ago though!